Chevrolet India today announced its year-end retail campaign offering special discounts across its product line. 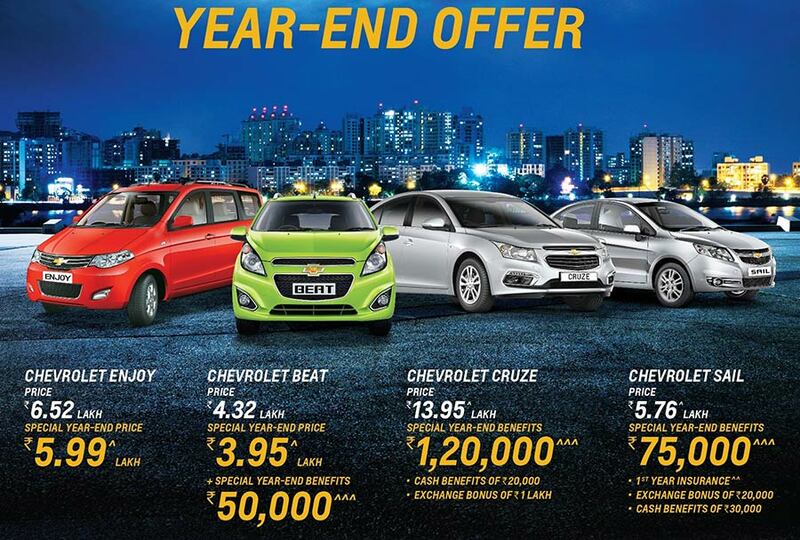 The offer will be available on Chevrolet bestsellers – Beat, Enjoy, Cruze and Trailblazer. As a part of this campaign, Chevrolet is encouraging customers to book an experiential drive online – on Amazon India – with whom it has partnered with, for an industry first initiative, as per their preferred date, time and location. Chevrolet is the first automobile company to partner with an e-commerce platform to reach out to a larger customer base and create a stronger presence in this format. The experiential drive bookings will go live from November 16th on the Amazon India website and app. To begin with, this service will be offered in four major cities – Chennai, Bangalore, Mumbai and Delhi – followed by other cities, basis customer feedback. We are a brand with a clear focus on our customers, where safety, quality and world-class experience are natural elements in our campaigns. We wanted to go that extra mile to delight our customers with this year-end campaign. The new campaign is in sync with Chevrolet’s promise to provide customized solution to customers. The 45 days year-end retail campaign will go live from November 10th for the customers to avail exciting deals on the entire product portfolio. By bringing the year end offers in the month of November instead of December, Chevrolet has reiterated its commitment to respond to the changing trends and customer demand in India. To reach out to more customers, a multi-media campaign led by mobile and digital media has been rolled out. Print and OOH will also remain an integral part of the campaign. , said Hardeep Brar, VP, Sales & Network, GM India. Chevrolet continues to engage with new customers who value relationships for life and an enhanced experience at every step. Chevrolet’s portfolio in India includes – Beat, Cruze, Enjoy, Sail, Sail Hatchback, Trailblazer and Tavera. Chevrolet has a strong plan to launch at least five new models within the space of 24 months.